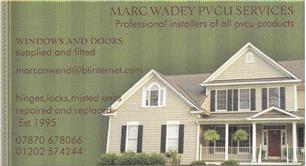 Marc Wadey PVCU Services - Fascia/Soffits/Guttering, Roofer, Windows/Doors/Conservatories based in Bournemouth, Dorset. M.WADEY PVCU Services has been established for over 16 years in the supply and PROFESSIONAL installation of pvcu fascias, soffits, guttering and pvcu windows and doors. Starting out initially working for a well known national company, I now carry out mostly all my own work but still sub-contract to several well known local companies. I differ from many companies as I do not employ sales staff so there are no commissions to pay keeping costs far lower. You only pay for the work and materials you require. All work is supplied with a written guarantee and certificates where applicable. All aspects of repairs to pvcu windows, doors, sealed units, fascias, soffits and guttering. Please visit the gallery to see my work firsthand. Professional plasterer and painter but a dab hand at carefully removing windows and doors.